The GSII is the original 60” Goalrilla backboard Goalrilla produces a line of premium basketball goals, and has been in business since 1991. The GLR GSII (model B3200) features a 3/8 thick, 60″ tempered glass backboard a a 6″ one-piece square pole. The backboard overhang is 3 feet. The height adjusts infinitely from 7.5 – 10 feet with the use of a crank handle mechanism. 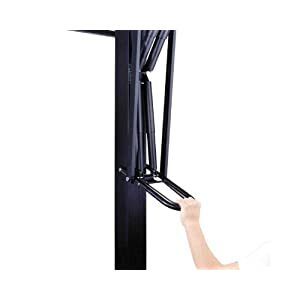 Included is a pro-style flex rim and an anchor bolt mounting system. The frame is powder coated to provide resistance against corrosion and UV rays. The GSII is backed by a limited lifetime warranty. 60″ backboard. A 72″ board maybe regulation size, but is too big for most driveways. A 60″ is the next closest thing, and is perfect for a two or three car driveway. Since most people can’t install an actual court in their yard, 60″ works well and probably better for most. 3′ offset. This amount of room allows players to be aggressive under the rim, while helping them avoid being knocked into the pole. It provides a more professional look as well. One-piece 6″ pole. This further adds to the overall stability of the hoop. It’s also necessary in order to support a thick tempered glass backboard. Pole pad. 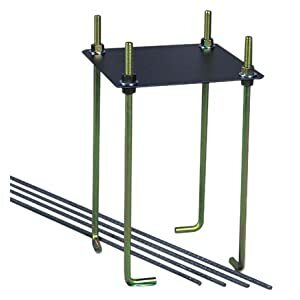 This version on Amazon.com actually comes with a pole pad, which is pretty uncommon. A lot of times you have to purchase one separately. No Padding. The GSII does not come with a backboard pad and pole pad. The safety of my kids is a top priority for me, so I had the additional cost for the padding. If I have $1500 to spend on a basketball hoop, this is the one. I am extremely happy with my decision to purchase the GSII for my family. It has all the high-end features of the regulation size goals, but is not too big for my driveway. The kids will not outgrow this goal as they get older, it will be big and sturdy enough to withstand the more aggressive play.